Joanne was somewhat cajoled into a swim by me (Manda) in 2011. Here is her account of how the Great London Swim was for her as a non goggle wearing pool swimmer, breast stroker and pretty much novice. Chapeau Joanne, Chapeau! 1. Flushing out your wetsuit is cold and hideous – there are no other words. 2. Most people at these events will be swimming front crawl so you better keep up. Unfortunately my front crawl is very poor and slow so I struggled to stay with my group and honestly, my left shoulder has never been quite right since. 3. Don’t think about what is brushing against your leg in the middle of a large lake and what you might be swallowing, it will only make you scream, cry or both. 4. The sense of achievement and adrenalin rush when you finish makes all of the above worthwhile. I came away from the experience with my eyes wide open about what lay ahead and about just how difficult it is to swim breast stroke in a wetsuit. The buoyancy that works for anyone swimming front crawl, just makes you pop up to the surface like a wine cork; it was something I was going to have to work on adjusting to. So I got back in my local pool, hit my first mile and then went off to Fairlop Waters for my next open water training session, only to find the lake was shut indefinitely owing to an outbreak of blue algae. At this stage panic started to set-in; there were no other local events I could attend before the big day, I had set-up a Just giving website to raise money for Alzheimer’s research (a charity very close to my heart) and sponsorship was pouring in, I had to do this swim and I had to finish. Coach Manda stepped in and suggested I go down to Tooting Bec lido with her one Saturday morning and have another practice session in my wetsuit. Both Manda and Katie were very supportive and encouraging, although I’m sure they must have been horrified by my lack of finesse in the pool. And then all too quickly the big day dawned, for once the British weather decided to behave and the forecast was for a warm and sunny day. My Mum and I took the train to the Royal Victoria Dock in London and stood by the finish line as earlier entrants were finishing; it was the first time I had seen the full distance completely laid out in front of me and it looked an awfully long way, and some of the people heading for the finish line were not looking good. I started to wonder if I could actually do this. The rest of “Team Joanne” arrived just after I had got into my wetsuit; my sister, her husband and their two young daughters. They wished me luck as I headed to the start line, telling them to grab a coffee as it would be at least an hour until I would come into view. Manda, being the amazing super mermaid that she is, was racing in an earlier “wave” of swimmers and was then going to run back to the start & re-swim it with me – a true coach and friend. 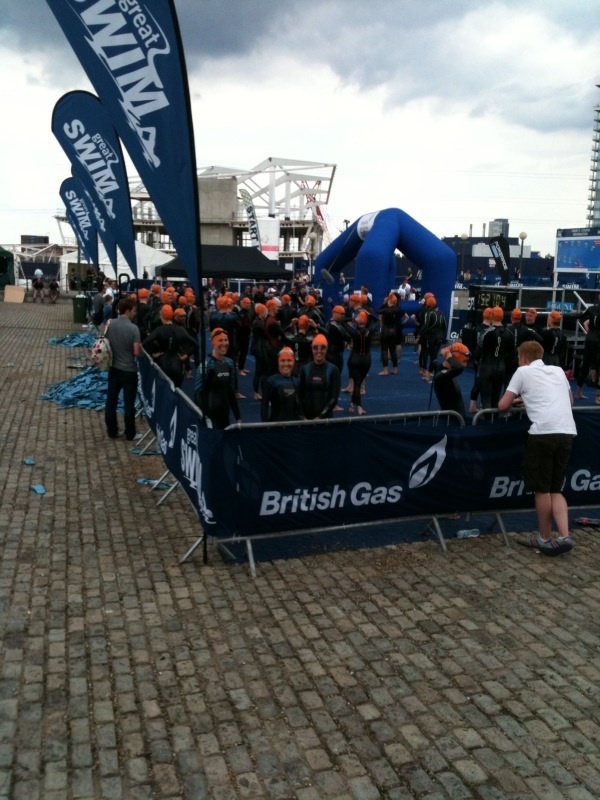 I got to the start, flushed out my wetsuit (it was 17 degrees and not that unpleasant) and waited to start. To say I was scared was an understatement, although probably not as scared as my Mum who I later found out had said to my sister, after they all waved me off with big smiles, “I don’t think she’s going to be able to do this. Have you seen how far it is?” My sister’s response; “It’s Joanne, of course she will finish”. Manda completed her first swim and joined me shortly before the start, I was so grateful to see her; words cannot describe the difference it made to have her with me. And then we were off and I immediately realised there was no way I was putting my face in that brown, disgusting water so I just swam breast stroke with my head up and my mouth shut, although as we started to hit the tide coming towards us it was impossible not to swallow some water. What do I remember about the experience? I remember there was an air show nearby and old fashioned war planes were flying overhead, I remember the halfway marker was a big pink inflatable bouy, I remember the tide being really strong and feeling like I wasn’t moving at one point, I remember my youngest niece screaming me on (I’m not sure she understood what cheering was), I remember Manda swimming to my left and guiding me around the halfway marker so I would not swim any further than I had to, I remember her telling me we were still on track to finish within an hour, which was my target, even when I thought we had lost too much time battling the tide. The screams and cheers of my family and Manda’s boyfriend grew louder and we even had time to chat to one of the guys in a kayak, and then the finish was in sight. I got cramp just a few metres from the finish and I remember Manda and my Mum yelling at me to keep going as I was finishing in just under an hour. I kicked on and finally felt ground beneath my feet, a few seconds later I was across the finish line; my time was 55 minutes and 19 seconds. I was elated! My Great British Swim was an amazing experience and a real milestone in my life, plus I raised over £900 for charity which was the cherry on the top. Have I done anything else? No but coach Manda hasn’t given up “suggesting” other challenges. But to anyone thinking they are not a typical open water swimmer and that they could never do one, I am living proof that with sheer determination, practice and a donated wetsuit; anything is possible.